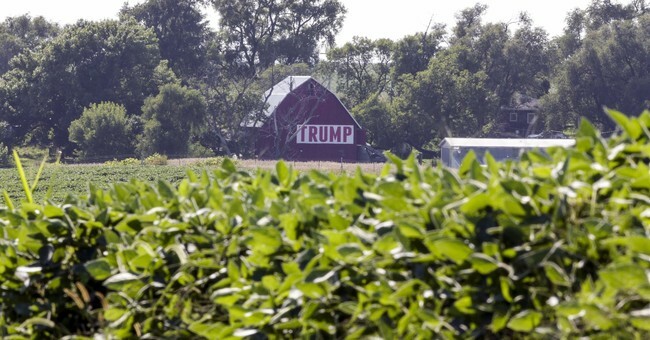 President Donald Trump is clearly concerned about the plight of American farmers. He pushed the Department of Agriculture to make available up to $12 billion of temporary relief to those farms caught in the middle of his tariff war – starting this Labor Day. It’s laudable that he wants to address this problem, but let’s remember that it was a problem of his own creation. America is a breadbasket to much of the world because of our exceptional farmland. We have about two-and-a-half times as much arable land as does China, for instance, with about the same landmass. That means exports are going to be a big part of what American farmers produce. And lo, fully 20 percent of farm revenues are from produce sales in foreign markets. So when President Trump started imposing steel and aluminum tariffs on other countries, what was the literal low-lying fruit that those governments targeted for retaliatory tariffs? That’s right, American produce. Farmers have contracts in foreign markets that were disrupted by this back-and-forth trade-warring. Many can't afford to fully harvest their produce this year and are having a hard time selling what crops they do have. In some sad cases, crops simply rot in the fields. And the damage already done goes far beyond farmers. Farmers for Free Trade has launched the “Tariffs Hurt the Heartland” to highlight the plight of many of those affected. Remember that there is a whole supply chain that farms rely upon to plant goods and get them to market, including suppliers, shippers, and others. Relief to farms, especially of the temporary kind and not coupled with assurances that market volatility will be smoothed over, does nothing for those other victims of unfree trade. It also does nothing to help farmers who have to plan for next year and beyond. Crops don’t just sprout up overnight. They have to be ordered, planted, and tended to – in some cases for years before they get a harvest big enough to bring to market. Trade-warring and the retaliatory tariffs that those conflicts produce do not have a good effect on American produce and related industries. Just in recent days, we’ve seen reports that wheat farmers, hog farmers, soybean farmers, almond farmers, beer brewers, lobstermen, dock workers, and so many others are being affected. The good news is that most of the damage isn’t permanent. The broader economy is booming. If President Trump reverses course and markets open up again, many of the job losses that have already occurred or are imminent can be reversed. The damage can be undone or mitigated. But if we have to go through another year of this, temporary farm aid simply will not cut it. Much farmland will be turned over to development or be reclaimed by nature. What crops are left will rot in even greater numbers and the rest of the world will find a way to replace American produce in their markets.